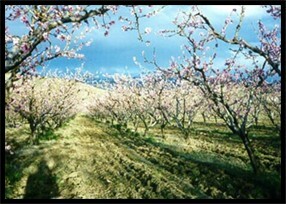 Morton’s Organic Orchards began in 1978 with the purchase of 10 acres which was planted in 2 acres of peaches and 8 acres of alfalfa. Dave and Mary, with the help of their two young daughters, planted and grafted hundreds of new trees. Inspired by their core philosophy of lifelong learning, they learned from their new neighbors and friends and, ultimately, Mother Nature. Every moment that wasn’t filled with farming was filled with teaching, which funded these early endeavors. Each long school day gave way to farm chores – pruning and watering and nurturing the crops. Summers were spent picking and delivering, personally, every beautiful piece of fruit. In 1990, Mary and Dave purchased an adjacent 2 acres with an historic barn which they restored. It was repurposed for use as a fruit processing center and cold storage so their packing operations could be moved from “field packing” to a packing shed. This allowed them to rapidly pack and cool their perfectly ripe fruit. Many of those original customers and now their kids still support them today! They quickly found that getting to know their customers was far more rewarding than wholesaling. As customer demand for organic fruit began to rise, Dave and Mary listened. They consulted friends and neighbors who were veteran orchardists, but all discouraged the change, doubting it would work. 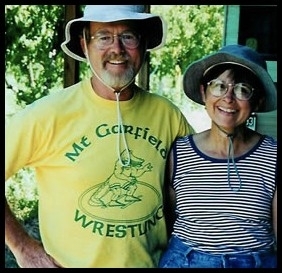 Fortunately, Dave & Mary saw a bigger picture – one without the use of toxic chemicals and practices – and they immediately began to Transition to Organic. By 1996, following the State of Colorado guidelines, Morton’s Orchards became Certified Organic and has maintained their organic practices, beyond the USDA certification standards, since that time. ~ installed solar panels on the roof of their old barn. ~ electricity from these panels runs water-sparing, micro-jet sprinkler systems, a walk-in cooler and the entire processing facility. ~ switched from oil-burning smudge-pots that blackened the air during spring frosts, to clean burning propane. ~ planted clover as a ground cover, a tiny flowering crop that eliminated tilling and soil erosion and better supported local native bee populations. Morton’s Organic Orchards continues as a family owned farm. 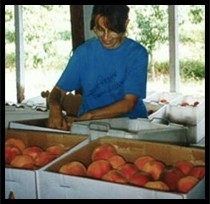 Three generations of family, Dave and Mary, daughter Heather Morton Burtness and husband Joe and their three daughters, living on both sides of the Colorado Rocky Mountains, work together every year to grow the sweetest peaches and stone fruit in Colorado! In 2017, Heather and Joe Burtness increased their organic fruit production with the purchase of the beautiful Aloha Organic Fruit orchards in Palisade. This 4000 tree acquisition demonstrates the Burtness family’s continued commitment to providing the highest quality organic fruit across Colorado. The Burtness family continues the tradition of putting their hearts and efforts into something meaningful, with careful stewardship for good health of the land, life and water.